No sailing experience is necessary to enroll in the program. Is learning to sail on your bucket list? Are you looking for a fun way to get out and enjoy our spectacular waterways? Here’s a chance to do both, as the Buffalo Harbor Sailing Club (BHSC) will once again offer Discover Buffalo Sailing — An Introduction to Sailing, a four-week program that explains basic sailing skills through a structured program of onshore chalk talks and hands-on experience on the water. The first session will be held on Saturday, May 18 from 8:30 a.m. to 1 p.m.; additional sessions will be held May 25, June 1 and June 8 from 8:45 a.m. to 1 p.m. A required Orientation Session takes place on April 18 from 6:30 to 8:30 p.m.
BHSC boat owners volunteer their equipment and time to give participants the best possible experience. Mentors and seasoned crew members assist as the program demonstrates how the wind and the sails move the vessel through the water, teaching basic boat handling and safety. Each session will consist of a 45-minute dockside chalk talk and 1.5-hour sail, weather permitting. In the case of poor weather, a dockside lesson will be substituted for the sailing. Each boat will have a mentor and a minimum of two seasoned crew members. Participants will be actively involved in sailing during each session. No sailing experience is necessary to enroll in the program. Participants must be at least 16 years old (and accompanied by parent if under 18) and agile enough to easily move around a boat in motion. Interested participants must pre-register online by April 1. Space is limited, so apply early! Cost: $75 (includes one-year $55 BHSC membership and $20 materials fee). Your membership entitles you to participate in racing and other special events offered by BHSC through the rest of the year. April 18, 6:30 to 8:30 p.m., Obersheimer Sailor Supply, 1884 Niagara St., Buffalo (second floor sail loft). This orientation session will outline program expectations, recommended equipment and boat assignments. It is also a “meet the skipper” night, as all participants and fellow crew members, including club mentors, will be introduced. Register online or contact Diana Augspurger, program coordinator, at Diana@buffaloharborsailingclub.org for more information. The Buffalo Harbor Sailing Club is the center of racing on Lake Erie in Buffalo. Established in 1977, the club is 501(c)3 nonprofit association operated by a volunteer board of directors who reflect the wishes of the membership. The BHSC does not have a clubhouse or docks. Their only asset is the committee boat that oversees the racecourse. The Buffalo Harbor Sailing Club supports the initiatives and rules of U.S. Sailing, the governing body of sailboat racing in the United States. For more information, visit http://www.buffaloharborsailingclub.org. 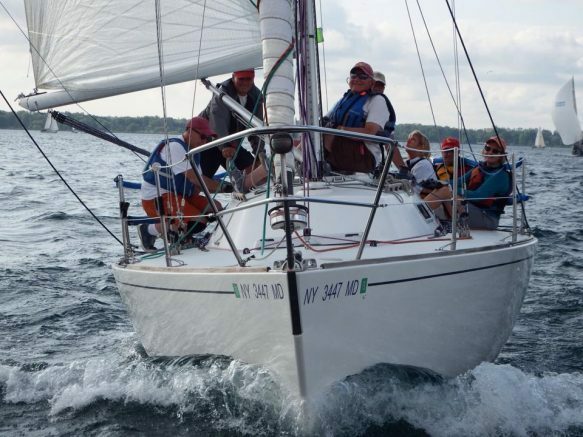 Be the first to comment on "Buffalo Harbor Sailing Club to offer four-week sailing program"